Delas-Frères can look back on one of the longest history in the region. It was founded in 1834 as a négociant house. In 1977 Delas-Frères was acquired by Champagne Deutz. When Deutz was purchased by Roederer in 1993 Delas-Frères came under the ownership of Champagne Roederer. Bruno Gonnet, communications director, was our host.The visit was highly educational. Bruno showed us the modern winemaking facilities of Delas-Frères und led a tasting of 7 wines. Delas Frères is a winery of tradition and renewal. Founded in 1835 in the heart of the northern Côtes du Rhône, the winery has thrived with the dynamism of its original founders and their heirs and more recently, the renewed energy of the Lallier-Deutz family, owners of Champagne Deutz. Delas Frères and Champagne Deutz were acquired by Maison Louis Roederer in 1993. André Lallier retired from daily winery duties in 1996, and Fabrice Rosset, a 20-year executive with Roederer, today leads both Delas and Deutz. Delas wines are crafted by a panel of experts headed by winemaker Jacques Grange. Together, the team makes wines that have been heralded for their intensity of flavor and excellent value. The winery was founded in 1835 when Charles Audibert and Philippe Delas bought Maisons Junique, a 40-year-old winery which they renamed Audibert & Delas. The house's reputation spread quickly worldwide as the winery brought home numerous awards from international competitions — notably a gold medal at Sydney in 1879. Philippe Delas had two sons, Henri and Florentin. The latter married the daughter of Charles Audibert, further strengthening the bond between the two families. In 1924, the brothers succeeded to the founders and changed the name of the house to Delas Frères. After World War II, under Florentin's son Jean and thanks to the widespread apreciation of French wines, the house experienced rapid growth. Jean visited new export markets following the brilliant success of Philippe Delas and Charles Audibert. To ensure a regular supply of the highest quality grapes to satisfy the growing demand, he extended the family holdings by purchasing a vineyard in Châteauneuf-du-Pape and enlarging the Hermitage vineyards. 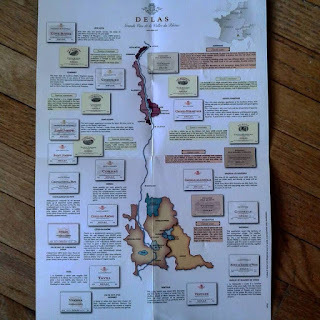 When Jean's son Michel took control of Delas Frères in 1960, the winery had become one of the major houses in the northern Rhône, where it owned and controlled prestigious vineyards in Hermitage, Cornas, Côte Rôtie, and Condrieu. Applying stringent marketing policies, Michel Delas sold only products of unfailing excellence. His qualitative intransigence and commercial dynamism did not come without a price, and the firm found it required an immediate injection of capital. Michel approached another famous name in the wine world, Champagne Deutz. In 1977, André Lallier-Deutz, great-great-grandson of William Deutz, merged the two companies. In 1981, the house moved to its current premises in Saint-Jean-de-Muzols, a small village located two kilometers north of Tournon. The winery building, set amidst the vineyards of the St. Joseph appellation, covers more than 3000 square meters. The winery was upgraded from old wooden casks to 600 new barriques and the building of an extension to the winery. In addition, additional vineyard land in Crozes- Hermitage and Hermitage was aquired. .
Delas’ winemaking philosophies include: 100% destemmed fruit, cold maceration, minimal rackings, reducing sulphur levels, extensive lees aging and bottling the top cuvées without fining or filtration. 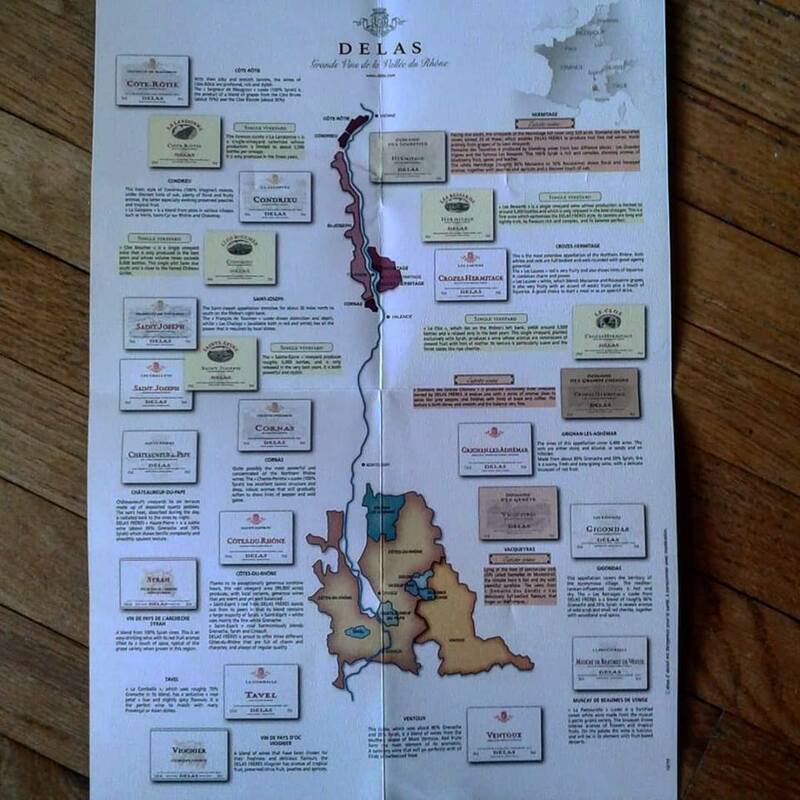 Currently, Delas offers about 2 dozens of different wines from both the Northern Rhône and Southern Rhône. Les Bessards is a single vineyard wine from Hermitage. Production is limited to around 6 bottles, only released in the best years. La Landonne is a single vineyard selection in Côte Rôtie, with the production limited to about 2500 bottles per vintage. Clos Boucher is a single vineyard wine from Condrieu, with the production limited to 6000 bottles. Le Clos is a single vineyard wine from Crozes Hermitage, only released in the best years and limited to 6000 bottles. 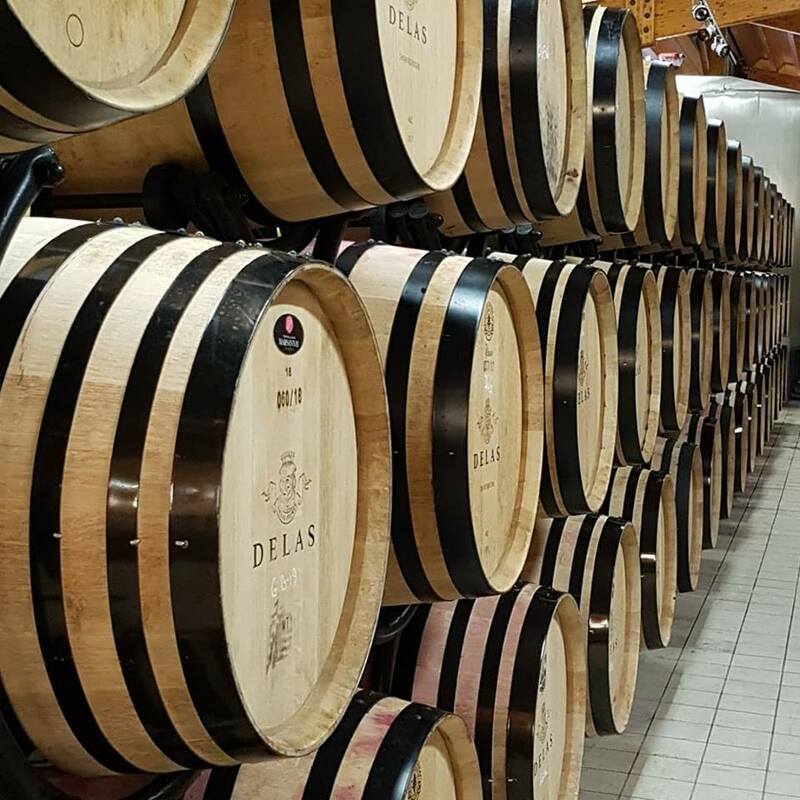 Delas Frères grows 30 hectares of vines comprising 10 hectares in the Hermitage AOC, 2 hectares in Saint-Joseph AOC and 18 hectares in Crozes-Hermitage. In addition to the grapes produced by Delas' own wine growing team, Delas' close relationships with like-minded owner-wine growers ensure that the company is able to source grapes grown on individual parcels, which reflect their own unique terroir. Below the single-vineyard wines, or perhaps at the same level in terms of quality, are Delas Frères' estate wines. These are wines produced exclusively from plots owned by Delas Frères. There are three estate wines. These are wines produced by blending wines from different blocks. Domaines des Tourettes, Hermitage, is produced by blending wines from 2 different blocks: Les Grandes Vignes and Les Bessards, the famous block of which Delas Frères also produces a single-vineyard wine. Under the Domaine des Tourettes label you find both white and red Hermitage. Domaine des Grands Chemins, Crozes Hermitage. Domaine des Genêts,Vacqueyras. The vineyard area covers the two communes of Vacqueyras and Sarrians, near the Dentelles de Montmirail hills in the Southern Rhône. The remainder are 15 other wines, all non-estate and non-single vineyard wines. Bruno Gonnet, communications director, poured 7 wines.